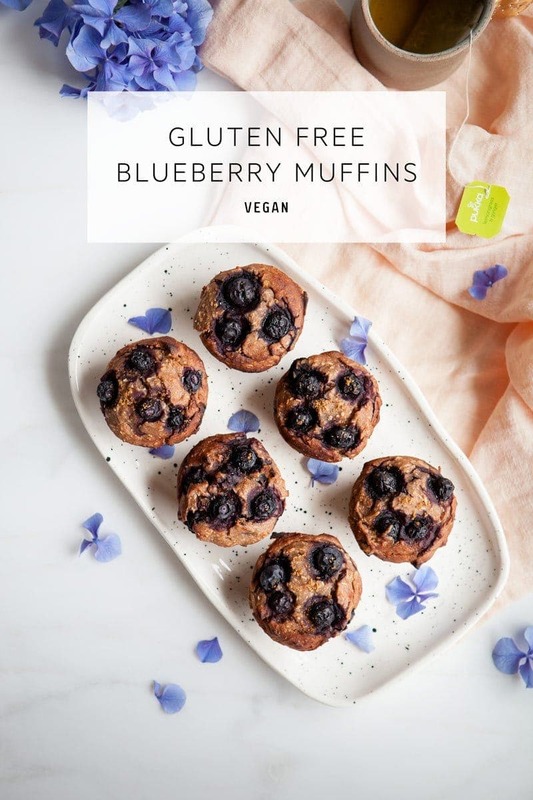 These gluten free blueberry muffins are entirely vegan, made with the nutrient-dense whole grain, teff. Soft and moist, with lemon and coconut. Oh the poor Elements – they’re so confused – it’s meant to be summer, yet – all this rain! I have to admit though, I’ll take a rainy day just as quick as I’ll take a clear summer’s day. Rain is just so cozy, it calls for building couch-nests, reading tarot cards by a scented candle, soft gypsy music and freshly baked muffins. Don’t you think? I’ve made several batches of these this week, and have found the recipe quite forgiving, which is great news for those of you that are creative free-style cooks. 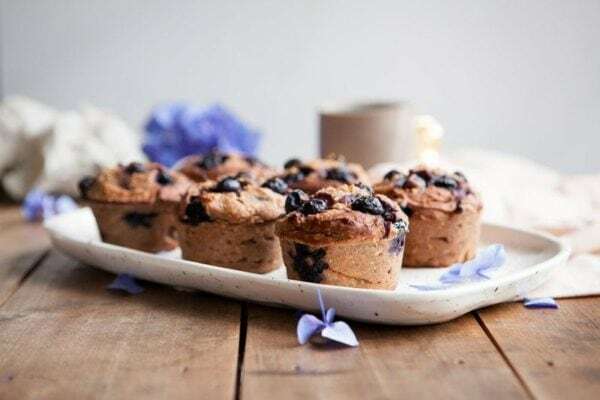 I’m quite happy with the muffins not only because they are super natural, gluten-free and entirely plant-based, but because they have been a happy experiment with some recently acquired organic teff flour. Teff is a particularly nutritious, tiny gluten-free grain hailing from Ethiopia (apparently, it takes about 100 grains of teff to make up the size of a kernel of wheat). It is relatively new on the shelves here, but has been farmed in Ethiopia for over 3,000 years. It comes in many varieties however the flour I purchased was a lovely brown colour. It has a pleasant, slightly sweet, nutty, caramel taste. It seems to have gained superfood status fairly quickly due it being a nutrient-dense alternative to wheat for those with celiac’s disease. It is particularly rich in iron and calcium – more so than most other grains. A good source of a range of other minerals , however, mineral content varies across varieties. Generally speaking red teff is richer in iron and calcium than white or mixed teff . I always seek out organic and fair trade when purchasing products such as teff. 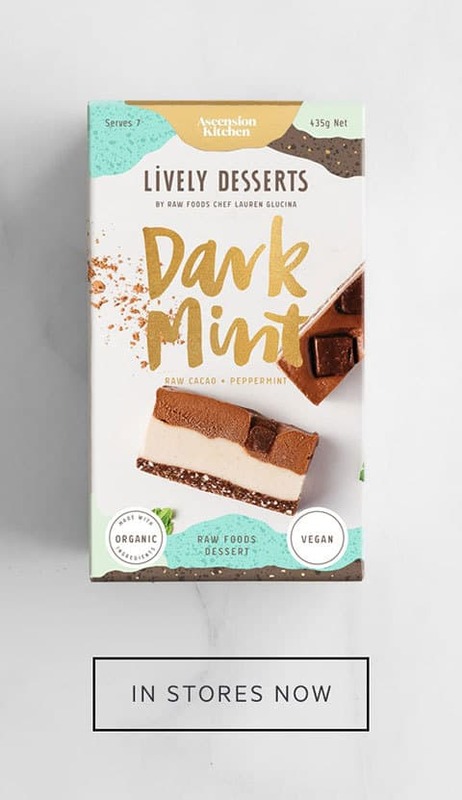 Fair trade ensures the farmers are paid a living wage, creating a positive knock-on effect throughout the community, as too often they are exploited in the market. Do you remember all the articles that came to surface during the quinoa boom? The sharp increase in price driven by Western demand left Bolivian locals unable to afford their own staple, which is extremely heart-wrenching to hear. In fact, the Ethiopian government has only recently lifted a ban on raw teff export, issued to protect against food insecurity, as teff is indeed their staple and main source of nutrition. In fact, a large single piece of their fermented sourdough flatbread, injera, is thought to supply enough amino acids to sustain life without any other protein source . 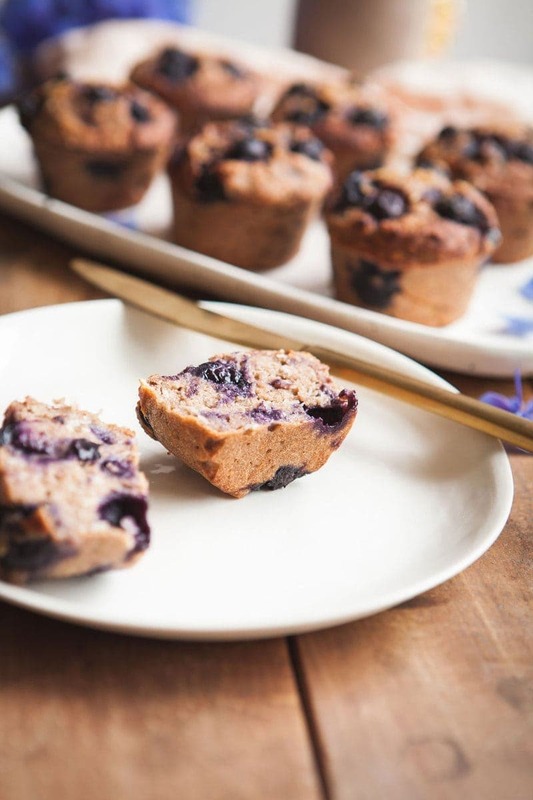 As mentioned, the recipe for these healthy muffins is accommodating and you can easily interchange the whole grain flours. I recommend keeping in the coconut however as it adds a lovely flavour. The apples I used were stewed. Every Sunday, we have a family dinner, and inevitably take home a goodie bag filled with left overs. Mum has been stocking up on the new season organic apples from the markets – and stewing them to serve with coconut yoghurt for dessert (simple and delicious). Apples actually make for a great binder, so no need for eggs or egg substitutes such as psyllium husks, chia or flax. Ripe banana would be a great option also. If you were to use tinned apple puree however, you may find the muffin batter is a bit on the thin side, in which case I suggest adding in a tablespoon of psyllium/chia/flax meal to thicken and bind. These are delicious warm from the oven with a smear of coconut butter, or simply with a sprinkle of coconut sugar over the top. I hope you enjoy – if it’s going to rain, let’s cozy up in style! 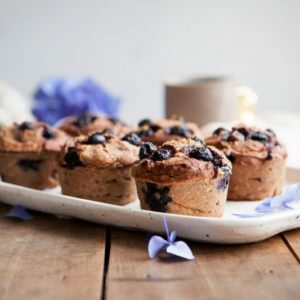 These gluten free blueberry muffins are entirely vegan, made with the Ethiopian whole grain, teff. Soft and moist, with lemon and coconut. You will need a blender for this recipe. Pre-heat the oven at 180˚C (356˚F). 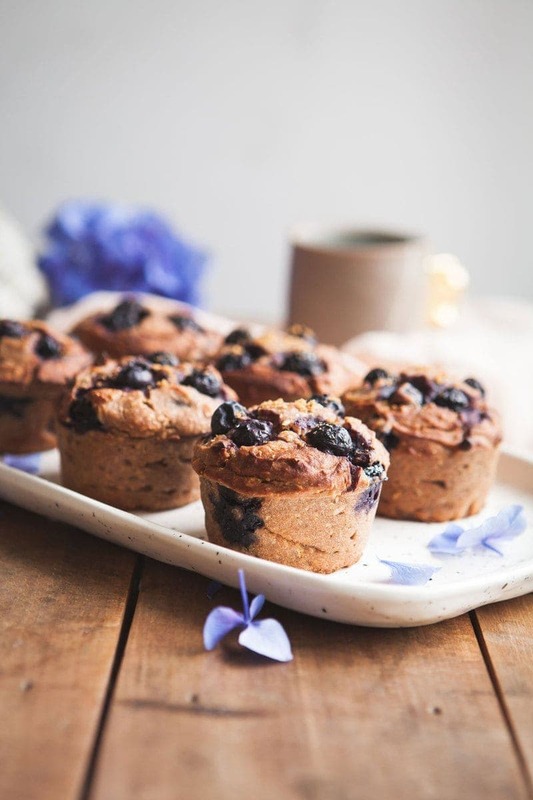 Lightly coat the interior of 8 muffin moulds with coconut oil for easy removal once baked, or line with a paper muffin case/baking paper. In a blender, whiz all wet ingredients till smooth then pour over the dry ingredients, mix with a spatula to combine. Fold through the blueberries (if frozen, thaw first) and lemon zest. 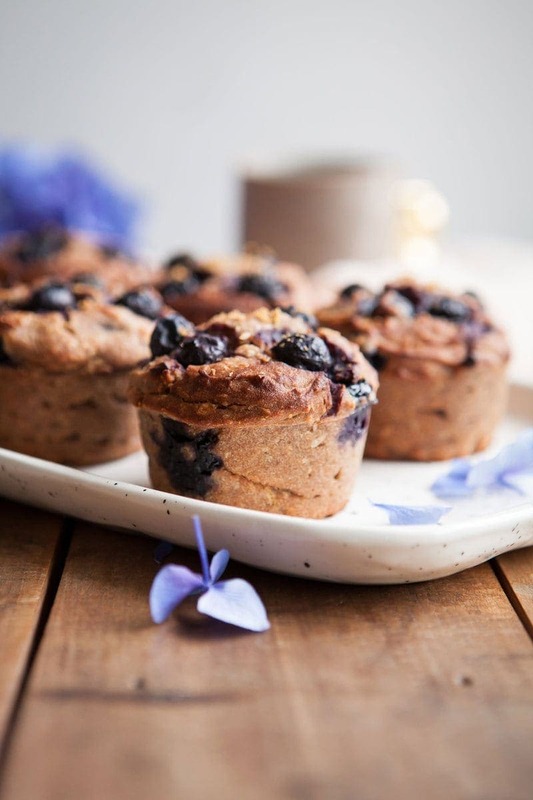 Spoon into muffin moulds – right to the very top, then press in three or four small blueberries into each. Bake (force fan) for up to 20 minutes, or until a skewer comes out clean. Once cooked, let sit in the muffin tin for 10-15 minutes before turning out onto a wire rack. Serve once cooled, perhaps with a sprinkle of coconut sugar over the top. 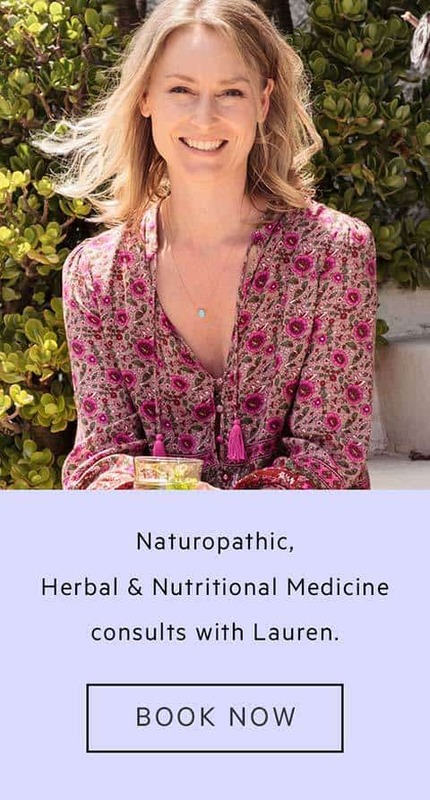 • Teff and buckwheat flour can of course be used interchangeably – in fact, you may even want to try all of one, or replace one of them with sorghum flour – which also works really nicely. • Ripe bananas would be a good swap for the apples. If using tinned apple puree, you may find the mixture is a bit thinner. If this is the case, try a tablespoon of psyllium husks or ground chia to thicken it up again and help bind.